1828, Vienna: When Ignaz Bösendorfer started his own piano manufacturing company the young virtuoso Franz Liszt is ruining almost every piano with his passionate playing. At this time, there are nearly 150 piano builders in Vienna alone, which actually illustrates the importance of piano music. Following the advice of his friends Liszt selects a Bösendorfer Grand for his concert and, in fact, this piano withstands his powerful performance. Bösendorfer becomes famous overnight. A close friendship shall evolve between Franz Liszt and Bösendorfer. This Bösendorfer Grand, crafted with precious Vavona veneer, is a tribute to this exceptionally talented, pianist and composer, who himself owned quite a few Bösendorfer Grands. The close relation with Bösendorfer is documented by more than 40 letters and telegrams written by Liszt. Pianists have always found a reliable partner in a Bösendorfer Grand. Artists do not have to limit their virtuoso play in any way and may unleash their artistic play freely. Like Liszt once did. 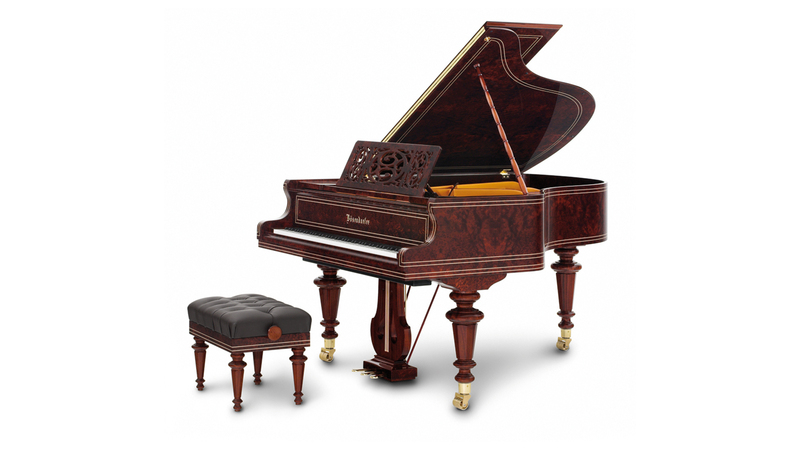 The perfection of a Bösendorfer exceeds my wildest expectations.